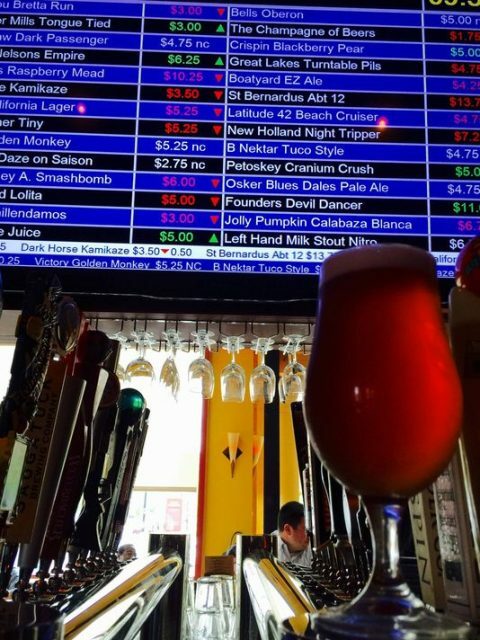 A bar in Lansing, Michigan has opened that will price its beer depending on the demand from its customers. Known as the Lansing Beer Exchange, the Lansing State Journal explains that “Stock Market” hour will begin at 6pm every day, and customers will be allowed to monitor the prices on screens above the bar. Flora explains that something like a Bell’s Oberon could start at $4.50, but could rise to $5 should there be a heavy demand for it. The staff will choose when to “crash the market,” which will bring every beer on the menu down to its minimum price for five minutes – making Oberon cost just $2.50 and a Miller High Life just $1.50. Flora came up with the idea for the bar while travelling in Germany during the early 2000s, where he stumbled into a bar that had a similar premise, and years later he decided to expand on it and open the bar in his home town.